Biking Viking provides a support vehicle for this tour. Advanced riding skills are required for this tour due to tough road and weather conditions, river crossings etc.! This tour is designated for the more advanced rider. 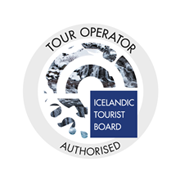 The ride takes place on the beautiful south coast of Iceland, where we pass lava-fields, spectacular waterfalls, glaciers and a lagoon with drifting icebergs, before we head up the east coast and in to the highlands to Hell. From Hell (the name of an explosion crater) we head south on a black desert track where we have to cross a few rivers. Before we get back into civilization, we will have ridden around Europe’s largest glacier Vatnajokull. Day 1: Welcome dinner with the guide at a restaurant in down town Reykjavik. Day 2: Our first day of riding is easy and mostly on paved roads, which gives us an opportunity to get to know the bikes well. Heading east we will ride along Iceland’s south coast with a stop at Seljalandsfoss and Skogarfoss waterfalls. Heading further east we will stop at Dyrholaey and Reynisdrangar, a spectacular cliff formation, cross the Myrdalssandur black desert and Eldhraun lava-field before stopping for some refreshments and fuel. 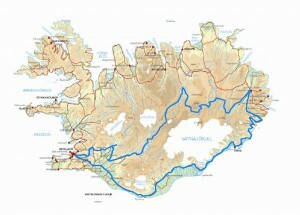 From there we will cross Skeidararsandur desert on the route to Skaftafell and our accommodation for the night close to Europe’s largest glacier, Vatnajokull. After breakfast we continue our journey to the east coast in the shadow of Vatnalokull glacier. Our first stop of the day is Jokulsarlon, a lagoon with floating icebergs, where we go sailing in between the drifting icebergs. We continue riding along the glacier for another hour, stop for lunch at Hofn where, if the weather allows, we’ll enjoy a spectacular view of the glacier. After lunch we head up the east coast on some of the most spectacular roads in Iceland over a mountain pass to our accommodation for the night at Egilsstadir. The ride on day 3 is quite easy, which is convenient because on day 4 we must face a challenging ride to “Hell”. After a steady breakfast the real adventure begins as we head to the highlands. We cross the biggest dam in Iceland on our way to the highland tracks, as well as some rivers on the trail taking us to Hell. Hell is an English name for an explosion crater called Víti in Icelandic (Víti means Hell). At Hell we will enjoy the scenery and our refreshments. After lunch we follow the trail to our accommodation at lake Myvatn. On this day’s ride we’ll cover around 390 km of which 220 km will be on challenging gravel roads. After breakfast we ride to our first stop of the day at Godafoss waterfall where we top up the fuel and stock up on refreshments for the day. Heading south we will cross Sprengisandur trail, which is a 200 km black dessert trail with exceptional scenery and river crossings where your advanced riding skills are required due to tough road conditions. We take a short break at Nyidalur hut before heading to our accommodation at the Highland Center of Hrauneyjar. Day 6: On day 6 we’ll cover around 260 km of relatively easy riding. Heading back to Reykjavik, we pass volcanic mountain Hekla on the route to our first stop at the Viking hut Stong. Then we head to Gullfoss waterfall and Geysir where we stop for refreshments and fuel for our trip to Thingvellir national park, the birthplace of the modern parliament. From Thingvellir the route lies to Reykjavik. We go over the trip over a farewell dinner in the heart of the capital. Not included: Personal travel insurance. Alcoholic beverages. Alternative tours. Flight. Tips.